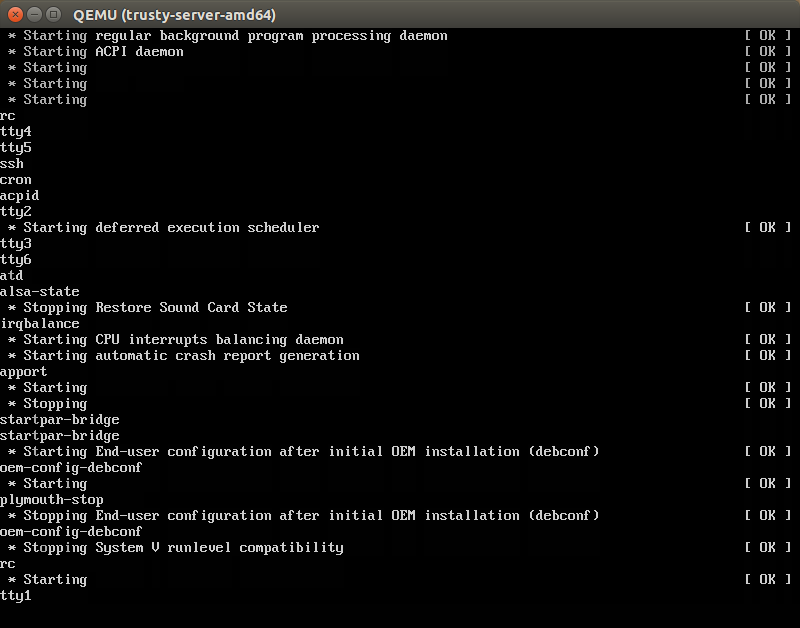 When doing a server install with the latest Trusty daily (2014-03-24) in OEM mode, the boot hangs during the first boot after the install. Please see the attached screenshot. It renders the system temporarily or permanently unusable. Have you tried swtiching to other virtual terminals? I believe I was experiencing the same issue, only to find that the display was stuck on vt7 for some reason, but there were in fact logins waiting on vts 1-6. Adding "text" to the kernel command line seems to mitigate this issue in my case. @jcollins... interesting, I'll give that a try. Thanks! The referenced bug report does have a patch that fixes the issue. Seems that the upstart job was changed to no longer connect STDIN, which is required by oem-config. You'll just need to make sure to add the patch before running oem-config-prepare. The attached patch should completely work around this issue. The attachment "switch to vt1 if not running oem-config" seems to be a patch. If it isn't, please remove the "patch" flag from the attachment, remove the "patch" tag, and if you are a member of the ~ubuntu-reviewers, unsubscribe the team.